LONDON – Scorpio Partnership’s latest edition of the Global Private Banking Benchmark Report released today reveals an industry facing tough challenges ahead to achieve growth. In the last financial year, the majority of private banking institutions experienced a notable slow down in AUM growth and a squeeze on operating margins. Among the factors affecting results has been volatile markets and clients hesitating to onboard business at levels previously experienced. The results portend tough times ahead for the industry adjusting to turbulent financial headwinds. *AUM YE2014 figures have been restated to adjust for changing methods in financial reporting by private banks and in some cases are not consistent with previous years’ press releases. 1Bank of America Merrill Lynch’s Global Wealth and Investment Management division AUM includes Merrill Lynch Global Wealth Management (MLGWM) and US Trust, Bank of America Private Wealth Management & Other. The firm reports total client balances of USD2,456.8bn including USD900.9bn in AUM and USD1,040.9bn of brokerage business for this division. Assets in custody of USD113.2bn are excluded and banking deposits of USD260.9bn and loans and leases of USD140.9bn for this client segment. Furthermore, MLGWM accounts for 81% of client balances in 2015 (USD1,985.3bn). US Trust & Other accounted for the remaining 19%. 68.4% of MLGWM client balances are USD1mn+ accounts (source: Credit Suisse Financial Services Conference, 2014). The estimated AUM for Bank of America Merrill Lynch attributable to HNW clients is USD1,444.8bn. 2Morgan Stanley has total AUM of USD1,985.0bn including deposits of USD149.0bn. 78.4% of total AUM is attributable to the USD1mn client segment (Morgan Stanley 2016 U.S. Financials Conference). Morgan Stanley’s AUM was calculated to be USD1,439.4bn for HNW client assets. 3Citi’s AUM is for accounts over USD1 million including Citi Private Bank assets (CPB targets clients with a net worth of USD25mn) and Citi Personal Wealth Management assets (CPWM targets mass affluent clients). 4JP Morgan’s AUM of USD437.0bn only refers to assets actively managed on behalf of Private Banking clients and does not include Brokerage and Deposit assets. The addition of custody, brokerage administration and deposit accounts would give total private banking client assets of USD1,050.0bn. 5BMO Financial Group AUM refers to BMO Wealth Management division. 6 HSBC AUM figure relates to funds under management placed with HSBC Global Private Banking division that serves high-net-worth individuals and families. It excludes customers’ deposits of USD88bn. 7Wells Fargo’s Wealth Management division AUM includes client assets and deposits of USD225.0 billion as at Q4 2015. Amid the challenging financial markets, the leading 25 private banks have attempted to weather the storm. Unlike smaller operators, many appear to have benefited from their ability to reach out and appeal to a wider market. The top 25 managed USD11.0 trillion of HNW AUM in 2016 representing a 56.3% market share, up from 55.9% market share in 2014. Indeed, the average net new asset growth rate was up 33% from last year’s figures. However, for many, this positive news was cancelled out by the fluctuations in the global markets. 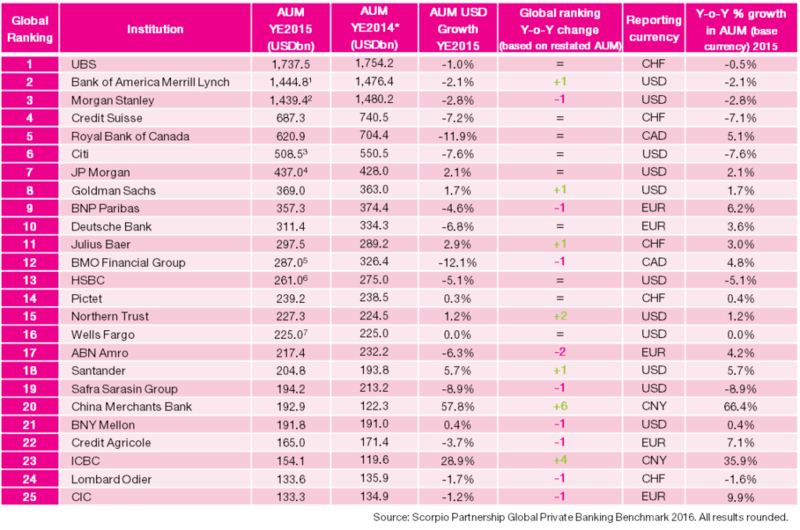 In terms of the top 25 private banking ranking, measured by AUM volumes, there is little positional change with UBS remaining the market leader. As a group, the top 25 also experienced better efficiency ratios with a 75.1% cost-income ratio which is five points better than the all industry average of 80%. However, their overall AUM levels dropped slightly more than the industry at large. While market volatility is a factor, some of this has also been impacted by a number of leading firms undergoing restructures of their divisional reporting lines. “Ultimately, the market leaders have focused aggressively on improving their cost-effectiveness in their operating models in order to weather the storm as best as possible,” said Sebastian Dovey, managing partner at Scorpio Partnership. “In spite of the tough times currently, the industry still has a positive future. Our HNW client feedback analysis evidences strong client engagement ratings with their provider experience across the same time period. But private banks will now need to become much better informed on what to do next to generate the best outcomes for client experience from a new assets and growth perspective,” he added. Scorpio Partnership’s HNW Client Engagement Score (CES) measures the overall rating of the client experience for their wealth manager by HNWs and UHNWs across the globe. The score is based on an aggregate across the three pillars of a wealth management relationship – Service, Proposition and Relationship. It forms part of a wider standardised insight process of client engagement developed by Scorpio Partnership for market leading operators across four continents. “The latest results indicate overall that active clients of the industry’s private banks and wealth managers are engaged with the service proposition and the alignment to their requirements. Indeed, as clients they are also fully aware of the headwinds faced by the industry’s professionals and the majority appear to accept the need to work with their wealth mangers through this period,” commented Cath Tillotson, managing partner at Scorpio Partnership. In terms of client sentiment, North America retains its crown as the leader in client engagement, and the gap with European client engagement standards is widening, from 11.9 points in 2013 to 12.5 in 2015. Asia Pacific clients are also exhibiting growing sentiment, with the CES rising 5.1 points since 2013. The annual 100 page report is the most comprehensive industry assessment of published financial performance information from over 200 private banks and subsidiaries globally. First released in 2001, the document has now come to be recognised as a leading independent indicator of the industry’s operating model performance and is required reading among the leading decision makers across the globe. Scorpio Partnership is a London-based strategy and research specialist focused on the global wealth management industry and the HNW client journey. In addition to its industry benchmarking, Scorpio Partnership’s unparalleled insight into the market is based on over 75,000 interviews with millionaires and billionaires and 12,500 professional advisors across 35 global wealth centres. The firm has now undertaken enterprise-wide client journey insight programmes for 40% of the world’s largest private banking institutions. To date in 2016, Scorpio Partnership has either won or been runner-up for awards for Thought Leadership in Asia, Europe and the United States for its insight work in the respective regions over each of the past four years (WealthBriefing). 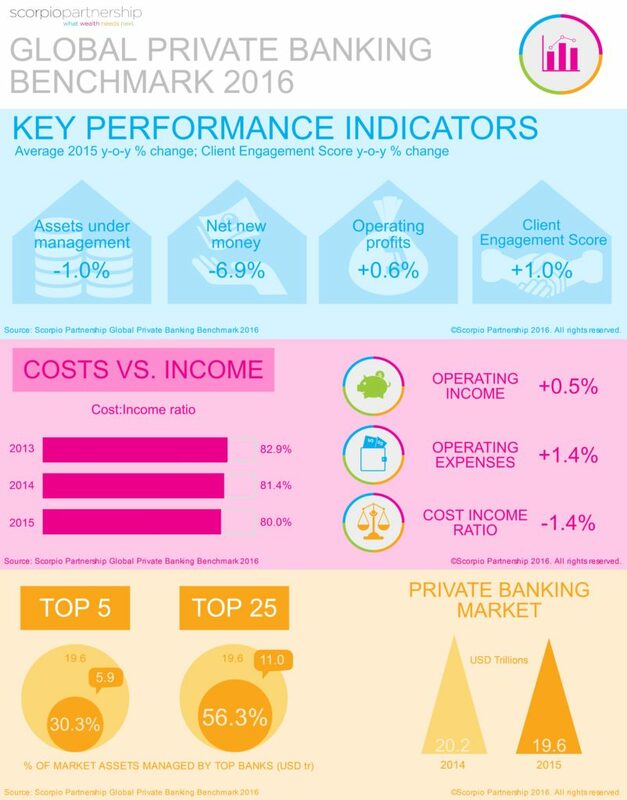 The Global Private Banking Benchmark 2016 collects data from a representative sample of wealth management institutions around the world from which to develop industry key performance indicators. To ensure consistency in the analysis, the analysis seeks data relating to the firm’s actively managed high-net-worth private client assets, including discretionary portfolio management, advisory portfolio management, securities or brokerage accounts, own mutual funds, term deposits, fiduciary deposits, savings accounts and managed trust assets. More specifically, the report aims to identify data relating to private clients who hold more than USD1 million (or the local currency equivalent) in actively managed assets with the firm. We note that not all firms conform to this reporting methodology. For further details on the reporting guidelines and the data reported for individual firms, please contact us directly. Scorpio Partnership was acquired by Aon in 2014. The report is available for purchase directly from Scorpio Partnership. For more information please visit our website www.scorpiopartnership.com.